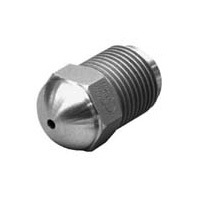 IMS Company - Anti-Drool Nylon Nozzle Tip, Special Modified Design to Accomodate Spreader Insert #111454 (Not Included), 1-1/2" OAL, 3/4" Radius, 5/32" Orifice, 7/8"-14 Thread Size, .88" Thread. Length, .60" Rear Opening. Anti-Drool Nylon Nozzle Tip, Special Modified Design to Accomodate Spreader Insert #111454 (Not Included), 1-1/2" OAL, 3/4" Radius, 5/32" Orifice, 7/8"-14 Thread Size, .88" Thread. Length, .60" Rear Opening.